Lindsay graduated from the University of Colorado at Boulder in 2007 with a BA in Molecular, Cellular, and Developmental Biology. She then received an NIH Postbaccalaureate IRTA and worked in the TSE/Prion Cell Biology Section at the NIAID Rocky Mountain Laboratories until 2009. Following this, Lindsay was awarded a Fulbright grant to pursue Alzheimer’s research in Austria. She stayed on to continue her research and graduated from the Medical University of Innsbruck in 2014 with a PhD in Neuroscience. 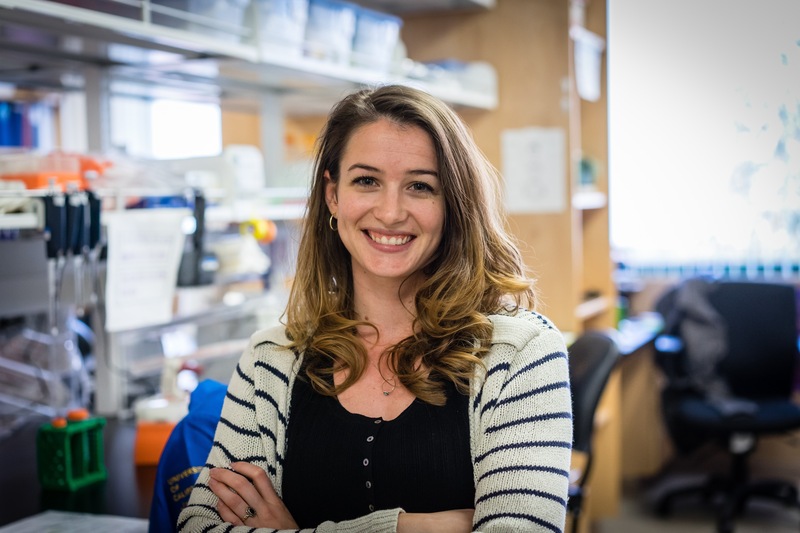 At UC Irvine, Lindsay will continue her work on Alzheimer’s disease trying to better understand how the immune system plays a role in neurodegenerative diseases. Lindsay’s hobbies include climbing, hiking, drawing, cuddling with her cute Husky Kaia, and speaking with an Austrian accent. Hohsfield LA, Humpel C. Intravenous infusion of monocytes isolated from 2-week-old mice enhances clearance of Beta-amyloid plaques in an Alzheimer mouse model. PLoS One. 2015 Apr 1;10(4):e0121930. Hohsfield LA, Humpel C. Migration of blood cells to b-amyloid plaques in Alzheimer’s disease. Experimental Gerontology, 2015 May;65:8-15. Hohsfield LA, Daschil N, Orädd G, Strömberg I, Humpel C. Vascular pathology of 20-month-old hypercholesterolemia mice in comparison to triple-transgenic and APPSwDI Alzheimer’s disease mouse models. Molecular and Cellular Neuroscience. 2014 Nov;63: 83-95. Hohsfield LA, Ehrlich D, Humpel C. Intravenous infusion of nerve growth factor-secreting monocytes supports the survival of cholinergic neurons in the nucleus basalis of Meynert in hypercholesterolemia Brown-Norway rats. Journal of Neuroscience Research. 2014 Mar;92(3):298-306. Hohsfield LA, Ehrlich D, Humpel C. Cholesterol diet counteracts repeated anesthesia/infusion-induced cognitive deficits in male Brown Norway rats. Neurobiology of Learning and Memory. 2013 Nov;106:154-62. Taguchi Y, Hohsfield LA, Hollister JR, Baron GS. Effects of FlAsH/tetracysteine (TC) Tag on PrP proteolysis and PrPres formation by TC-scanning. ChemBioChem. 2013 Sep 2;14(13):1597-610, 1510. Hohsfield LA, Ammann CG, Humpel C. Inflammatory status of transmigrating primary rat monocytes in a novel perfusion model simulating blood flow. Journal of Neuroimmunology. 2013 May 15;258(1-2):17-26. Hohsfield LA, Geley S, Reindl M, Humpel C. The generation of NGF-secreting primary rat monocytes: a comparison of different transfer methods. Journal of Immunological Methods. 2013 May 31;391(1-2):112-24. Hochstrasser T*, Hohsfield LA*, Sperner-Unterweger B, Humpel C. β-Amyloid induced effects on cholinergic, serotonergic, and dopaminergic neurons is differentially counteracted by anti-inflammatory drugs. Journal of Neuroscience Research. 2013 Jan;91(1):83-94. Florez-McClure ML, Hohsfield LA, Fonte G, Bealor MT, Link CD. Decreased insulin-receptor signaling promotes the autophagic degradation of beta-amyloid peptide in C. elegans. Autophagy. 2007 Nov-Dec;3(6):569-80.